If you look at numbers 10 years ago; the Mother & Child Care Market in India which is now estimated at ₹75,000 crores in 2015, was completely unorganized with not even one single retailer to address the needs. Only the ones who travelled abroad had the luxury of buying the necessary products, whereas the ones, who were dependent on the local brands or the unorganised stores, didn’t have much option to fulfil their needs. But times have now changed! We now have BabyOye.com. In December 2014, Mahindra Retail acquired BabyOye – a top eCommerce player in the Mother and Child Segment for an undisclosed amount. During the time of purchase, BabyOye was one of India’s largest online stores, which had more than 13,000 kids and baby products from over 500 brands. According to Mahindra Retail, they had done so in an attempt to expand the reach of their offline store ‘Mom & Me’ to a larger audience and also to secure their base in the eCommerce segment. 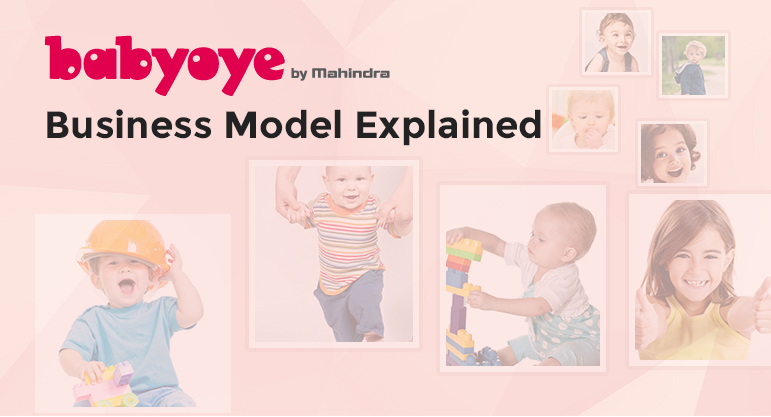 Post the acquisition, as a part of their Omni-channel strategy, Mahindra Retail also went on to drop the name ‘Mom & Me’ (both offline and online) and renamed all its 115 maternity and childcare stores as ‘Babyoye by Mahindra’ as well. On the other end, they shut their website down, and diverted all the traffic to BabyOye.com as well. Shockingly, this was the first time an Indian retailer had opted for the name of the company that it acquired, for its existing brand. But according to the company, they wanted a single unified brand presence across all channels and since, ‘Babyoye’ had a larger recognition, was more youthful, and gave better relatability to the younger parents, they chose this name. Since their acquisition, BabyOye has gone through a huge remodelling and today, it sells products across 11 major categories. What Is Babyoye.Com And Their Business Model? Babyoye.com was established in May 2010 in Mumbai and was subsidiary of ‘Nest Childcare Services Pvt. Ltd’. It is an eCommerce website which sells mother and baby products and services. BabyOye is a one stop shop from where you can purchase all kinds of products for your newborn, toddler or the mother. Other than that, you can also find a list of services related to pregnancy and infant care, offered by service providers who help you while birthing, breastfeeding, etc., and also advise you on nutritional requirements for you and your baby. The base purpose of the portal is an attempt to make the lives of new parents a little easier by helping them in making informed choices on what to purchase, what’s needed, what is available at different price points, etc. And not only that, but the portal also gives you the leverage to see what other customers think about the product you want to purchase as well. To help you achieve all that, Babyoye has partnered with 80 of the best National and International brands for distributing their products. The Market Segment they target remains the young parents with a decent income who prefer online mode of shopping. Talking about their Business Model – BabyOye followed an ‘Inventory model’, wherein it stored an inventory of the best selling products in their warehouses that would help them sustain for almost 15 to 20 days. Choose the products that you wish to purchase and add them to your shopping cart. Then check out of the shopping cart, to move on to making the payment using one of their payment options of – Credit cards, Net-banking, Debit cards, Cash on Delivery, Online Store Credit and Gift Cards. Input your billing and shipping address, choose the preferred mode of payment and follow the payment instructions. Other than that, to make the process even more easier, they also have a Call Center to guide you through the whole process and to help you to make the right purchasing decision. Their customer care number is – +91 22662 50000 (7 AM – 11 PM IST). But you still have to place the order online itself. Based on the nature of the product, the company has designed a multi-tiered shipping policy with its logistics partners – BlueDart and Aramex. As of date, they deliver within 3-7 working days to more than 5000 cities across India. They don’t accept orders below ₹100, but all the orders below ₹500 are charged with a convenience charge of ₹50, and all the orders above ₹499 are shipped for free. Their return policy is also pretty awesome too and all you need to do is, you need to return the package within 30 days of the sale date and receive a full refund minus the shipping charges. Sanjay has completed his MBA in Marketing from the Welingkar Institute of Management, and BE in Chemical Engineering from the Manipal Institute of Technology. He started his career Sify Limited as their Key Accounts Manager in 2001. Prior to BabyOye, a large part of his professional career had gone into demystifying, guiding and harnessing the power of telecommunication infrastructure for Bharti Airtel. He has worked with them for around 9 years at various designations including – Regional Consultant, Vertical head for M&D and Business Solutions, Regional Head for Business Solutions, Product Head for Domestic long distance, and lastly Head Commercial Management. Post that, being an urban Indian parent who wants to make informed decisions about critical infant-care / mother-care options, Sanjay launched his own venture along with his wife – BabyOye.com. Arunima has pursued her MBA in International Business from the Symbiosis institute of Management Studies in Pune, before which she had also completed her BBA in Marketing from the International Institute of Professional Studies from Devi Ahilya University in Indore as well. After completing her education, she had kick-started her career with Hyundai Motor India Ltd as a Management Trainee and later had moved on to work with Naukri.com after 2 years. She had worked with Naukri.com as their Vice President for more than 9 years in Noida, post which she monetized her expertise and launched her own venture with her husband – BabyOye! BabyOye had indeed managed to gain a huge popularity in a matter of few months, mainly due to its user experience. Beginning with the portal itself – the objective of the makers in regards to this eCommerce site was to provide a user-friendly, time saving platform to the Indian customers, offer relevant product information and options to users, evolve and change according to customer behaviour, etc. Hence, following that objective from day one itself, the portal was designed in such a way that it could deliver high performance, 99.99% uptime, and a robust and a scalable infrastructure, so that it could lead to providing solutions to modern Indian parents, with the click of few buttons. Other than that, BabyOye had also mounted-in a tool that helped them customize and refine the search based on various departments, the items or for that matter the age or gender of the child. The look-and-feel of the portal, along with the overall features and functionality, and fast response time, successfully managed to attract a lot of eyeballs! Further, BabyOye has also adopted for the franchising route to open physical offline stores as well. Additionally, it has also been seen offering its customers an ‘ABC’ program (Awesome Benefits Club) to its customers. Under this program, customers earn points for purchases made through online and offline stores, and can redeem them while making purchases on BabyOye. BabyOye has also partnered with all other daily deal sites like Snapdeal.com, Mydala.com, Dealsandyou.com, and many other online shopping and ecommerce platforms for customer acquisition. Talking about their Marketing Strategies… maintaining a high visibility on the digital medium i.e. social media sites has always been an important part of their marketing and CRM strategy. It has greatly helped them in interacting with their customers. They have been using the medium (more particularly Facebook) to launch interesting campaigns and contests to encourage users to participate and share views, post baby photos etc. They have been also been using it to launch products and get instant feedback on them as well. And going by the stats, BabyOye’s Facebook page has helped gain a tremendous increase in their traction. Now unlike other brands BabyOye does not use YouTube to promote themselves, their advertisement or promotional offers, campaigns etc., it actually uses YouTube to provide educational information like quick tips and counselling sessions to mothers who are looking out for some quick DIY (Do-it-Yourself) tips. Other than these, they have also launched a unique blog on their website called “Content Mom” which is a platform for mothers who hold the knowledge and experience of motherhood, to help others make parenting easy. Basically, Content Mom is a program through which any mother who wants to help others out, can come ahead and share her opinion of the products of BabyOye that she has used. In other words, you will have to review baby products, and for doing that you shall be paid as well. Although, it wouldn’t be in cash, but in terms of baby products, toys, clothing, and essentially the products that are a fit for your child’s age. Explain Their Revenues, Growth, And Roi…! The company that started operations in 2010, within a span of a year had expanded to 4,000 products, was receiving 1000 visitors daily, and was also registering 80 transactions per day. With employee strength of 15, their reach had also greatly expanded to 20,000 cities and towns across India in India. To add to that, they had also started expanding its team and was adding people to its merchandising, operations, products and marketing teams to reach a strength of 60 (roughly) in the next few months as well. They were also in preparations to expand from the two warehouses they had in New Delhi and Mumbai, to a few more. In 2011, the company also raised their first round of investment from Film actress Karishma Kapoor, who also became the largest individual shareholder in the company as well. This round was followed by the funding round of $2.5 million from Accel Partners and Tiger Global in April 2011. By 2013, the company had grown to 13,000 products that were offered by 120 Domestic and International brands. Although the official financial details were not disclosed, but going by the daily transaction of 300 to 350 at an average transaction size of ₹2,000, BabyOye was making revenues somewhere close to ₹30 crores. In the same year, BabyOye also ‘acquired its competitor Hoopos.com’ from its founder Vijay Jumani, to become a larger entity and gain better market share. And finally, their journey came to an end in December 2014, when Mahindra Retail acquired BabyOye for an undisclosed amount.